In previous articles, I discussed how humans parse what they see, so as to make sense of it, in just the same way that they parse the words that they hear. In both types of parsing, ambiguities can arise; in both types of parsing, those ambiguities can act as a source of interest to the person doing the parsing. This article looks at ambiguities in parsing landscapes, and at some speculative overlaps with art. In a later article, I’ll discuss how people parse landscapes, with particular regard to the practical implications for site design and for urban planning. Human vision is an active process, where the brain and the visual system actively try to make sense of what is being seen. If the scene is non-threatening, then ambiguity and/or vagueness in possible interpretations of the scene can be a source of enjoyable interest, in much the same way that doing a crossword or a Sudoku puzzle can be a source of interest. Here’s an example of a landscape that’s easy to parse. There’s a large hill in the foreground, and a second hill behind it toward the left of the picture, and then a greyish hazy band in the distance that might just be more hills, but is probably just clouds. The next landscape, below, is more difficult to parse. 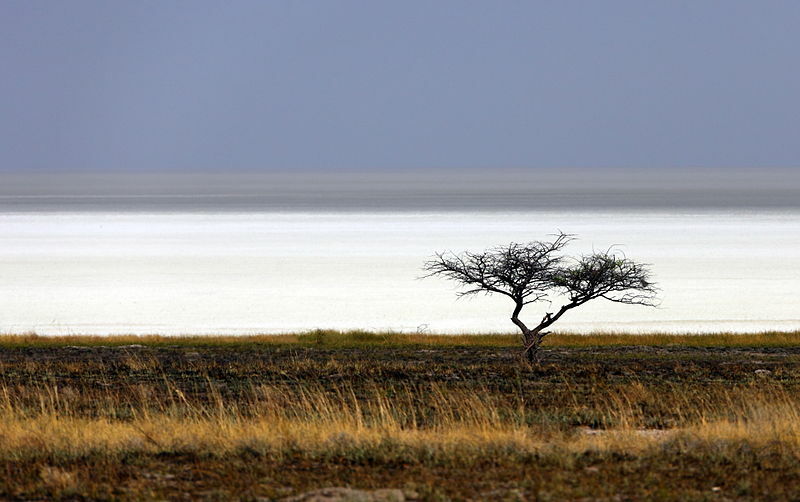 The foreground is easy – it’s dry grassland, with a solitary tree. 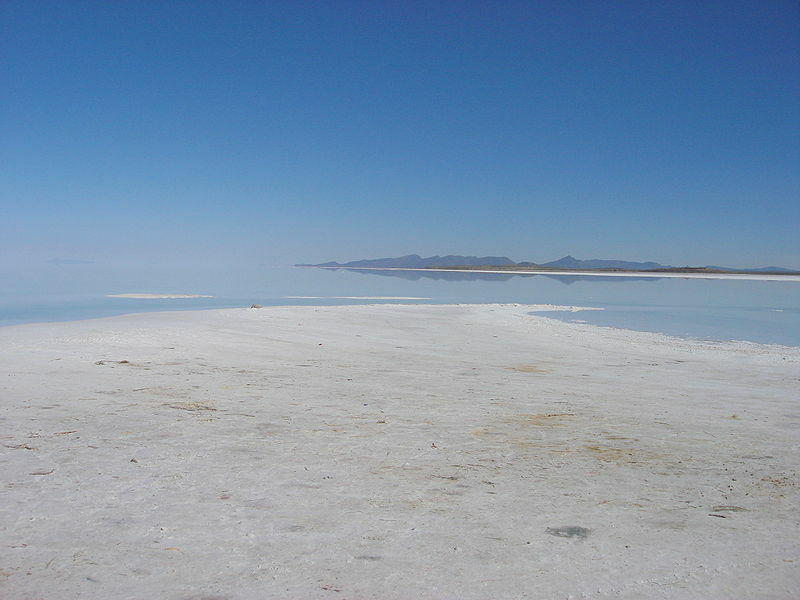 The white band in the middle, however, might be water, or might be a salt pan, or might be cloud, as in the image below of a cloud-filled valley. 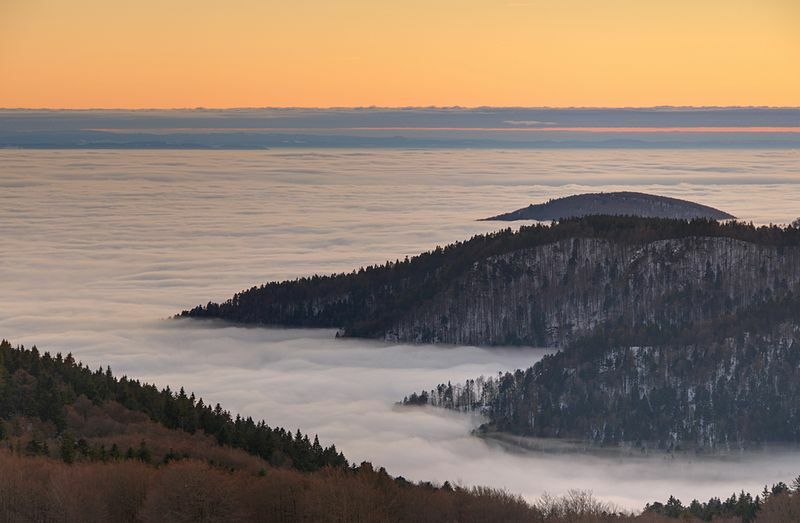 Similarly, the dark grey band above the white band might be cloud, or might be distant land (again, as in the image below). So, although the image above is simple in terms of the number of elements within it, there are multiple possible interpretations of the image, making it much more interesting than it might otherwise have been. 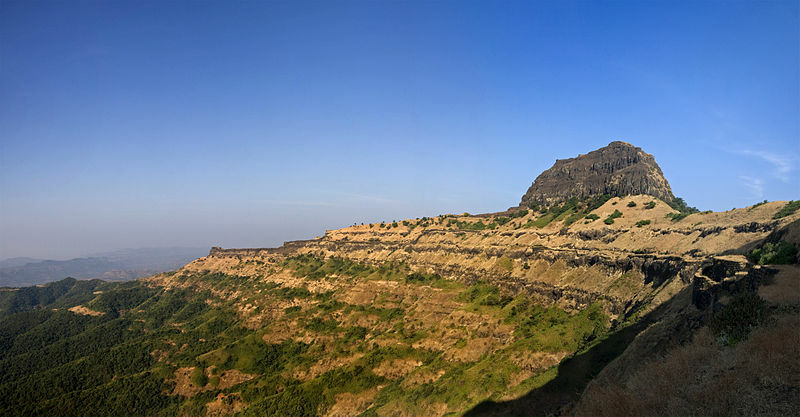 The images above are in landscape format. 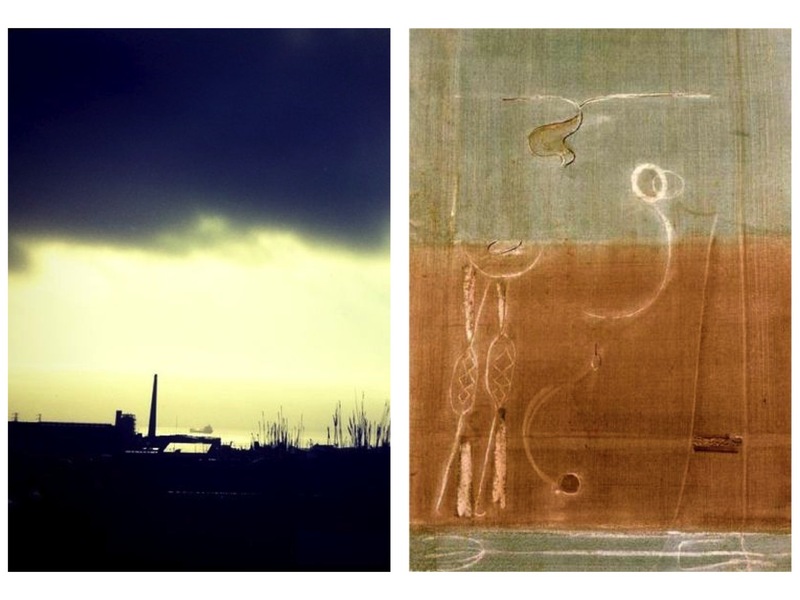 If we take the image that we’ve just discussed, and crop off the half that contains the tree, then we get an image that looks like some types of abstract art – in particular, some of Rothko’s images. 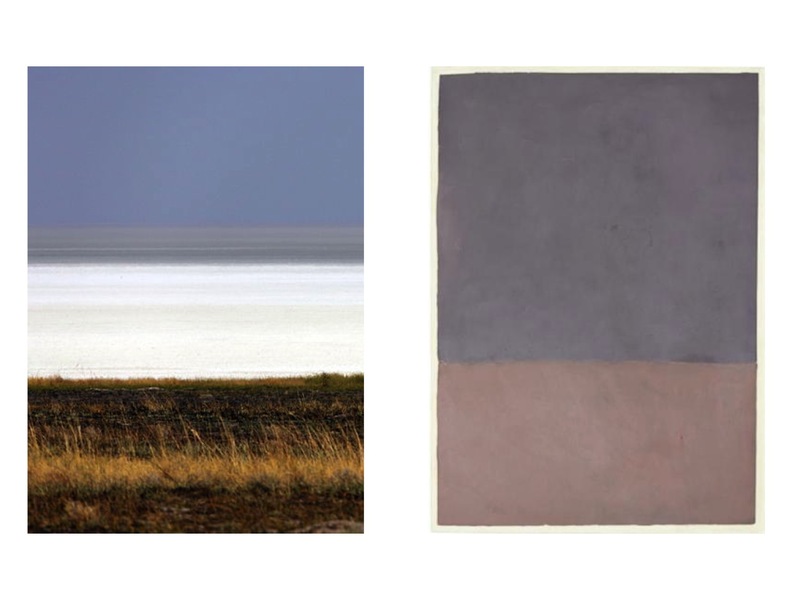 The resemblance between Rothko paintings and landscapes has been noted before, as in the original file name for the landscape photo below. If we juxtapose a cropped, portrait version of that image with a Rosko image, then the similarities are easy to see, in terms of the strong horizontal bandings of colour. 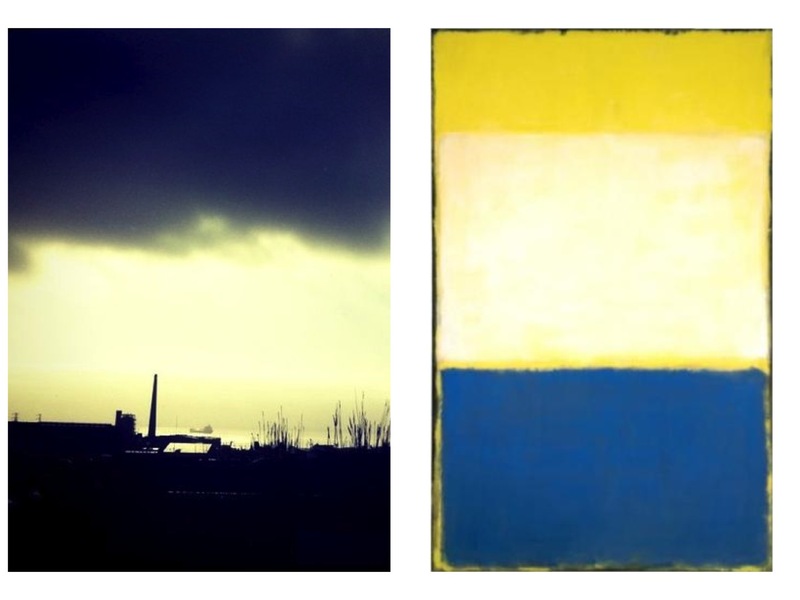 In terms of parsing, there are more interesting, deeper similarities between the photo and a different Rothko painting that at first sight looks very different from the photo, as shown below. In both cases, we have strong horizontal banding, that looks a lot like the familiar bandings of land and water and sky. The colours of the two images are very different, but in terms of parsing, they both have a second level of interpretation. In both cases, the horizontal banding is crossed by vertical elements that are harder to parse. Both images also contain small objects that are hard to parse (in both cases, looking like boats, about a quarter of the way up each image). Some clarification may be useful here, since this topic is prone to misunderstandings. I’m not suggesting that abstract art is really about landscapes, or that landscapes are abstract art, or that all human beings are hardwired to like particular types of landscape. That clearly isn’t the case. What I’m suggesting is that the underlying process of finding more than one non-threatening parsing for an image is inherently interesting and usually pleasurable, regardless of whether the image is a landscape, or an abstract painting, or something else. On a broader scale, I’m wondering whether the same phenomenon of parsing is one of the reasons for the experience of aesthetic pleasure in a wide range of media and activities that are usually treated as only marginally related to each other. The next sections examine this theme in more detail. In the cases above, the landscapes were difficult to parse because there were two or more distinctly different interpretations of elements in the landscape. In that respect, they’re similar to the classic example of an ambiguous image, namely the vase illusion. 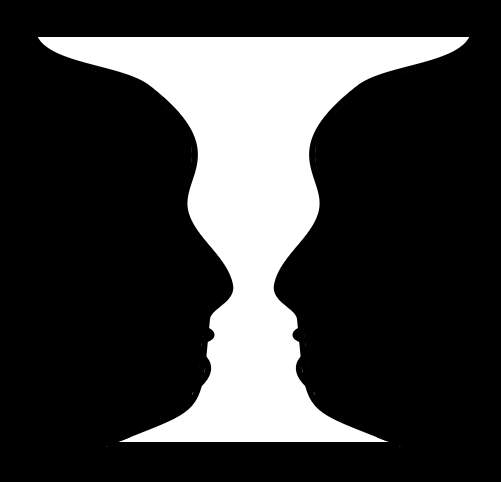 This image can be perceived either as two black faces in profile looking at each other, or as a white vase on a black background. Both interpretations are clear and simple. Some images, however, are hard to parse either because there isn’t enough information within the image to let us parse it, or because the image is of something so unfamiliar that we don’t know how to parse it. Here’s an example of an image that’s hard to parse because we don’t have enough information. It could be almost anything. We have no way of telling the scale, or the materials, or the context. If, however, we have the title of the file, then the image is much easier to parse. 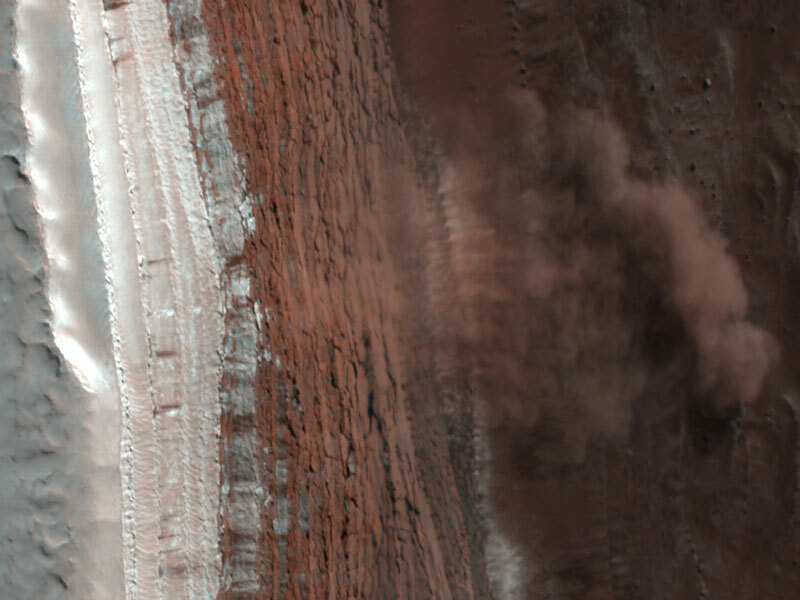 Knowing that it’s an image of an avalanche on Mars, we can parse the cloudy area in the middle right as a dust cloud, and from that parsing we can work out that the crisp red area in the mid left will be a cliff, and tha the grey/pink area on the left is probably the top of the cliff, perhaps with frost layers. With the image below, in contrast, knowing the title of the file does not help to make sense of the scene. Again, it’s an image of the surface of Mars. We know that it’s not a real forest, and that the name is figurative. 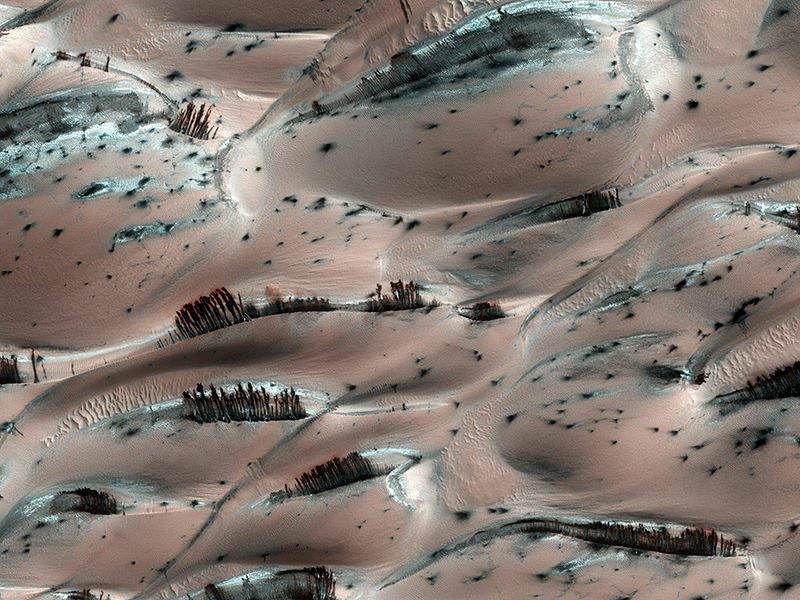 We can see enough ripples in the surface to know that we’re looking at sand dunes, and to get a rough idea of scale. But what are the reddish-brown vertical streaks that look like clusters of trees, and what are the grey-blue areas? It’s a very alien scene, that we can’t parse because we don’t have any experience of the phenomena that we’re seeing here for the first time. This is a very different type of parsing from the one in the image of the Martian avalanche, where we had ready-made relevant pigeonholes for the elements in the scene. In the “Martian forest” image, the problem is that we don’t have the pigeonholes. Not having pigeonholes is something that many people find uncomfortable; others, however, find it a fascinating new experience. The images we’ve looked at so far have mainly been of static scenes. The next two images involve parsing the activities within a scene. The image above is a familiar scene. 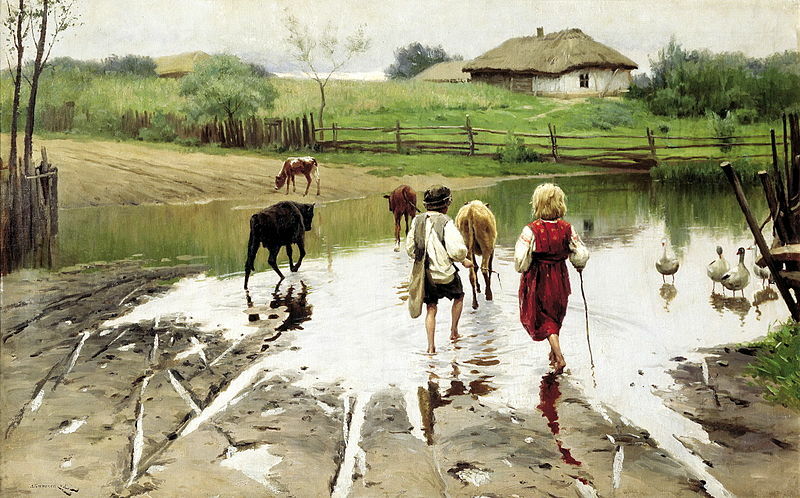 Two barefoot children are crossing a stream, with ducks and cattle in the stream, and a thatched cottage in the background. There’s a familiar parsing for everything in the scene. The children are driving the cattle to a field or a farm; they probably live in the cottage; their family probably owns the cattle and the ducks. It’s a scene that has been repeated untold times over the millennia. The scene below also shows a ford. In terms of parsing, however, it’s a very different proposition. At first glance, it looks like a familiar parsing, with a knight in armour on his horse, and a young woman clasped romantically in his arms. Then we realise that the knight is much older than usual, and the young woman is much younger than usual, and that there’s a young child behind him, clasping him round the waist. 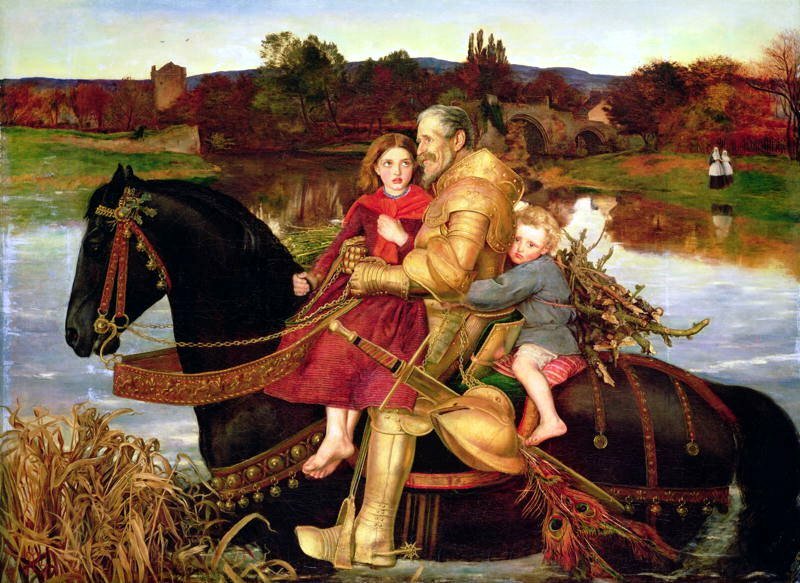 We now have to re-parse the scene away from the familiar pigeonhole of “young knight rescuing a fair maiden” into something different – perhaps “father rescuing his children” or “knight rescuing children”? We need more information to help us find a parsing that works, so we look further into the painting, and see that the younger child has a bundle of branches strapped to his back, and that both children are barefoot. These pieces of information suggest that the children are poor, so they’re probably not the children of the richly-equipped knight; maybe he’s helping them across the ford as an act of chivalry? Or maybe he’s rescued them from some tragedy? Do the two people in the background have any relationship to the story, or are they just bystanders? 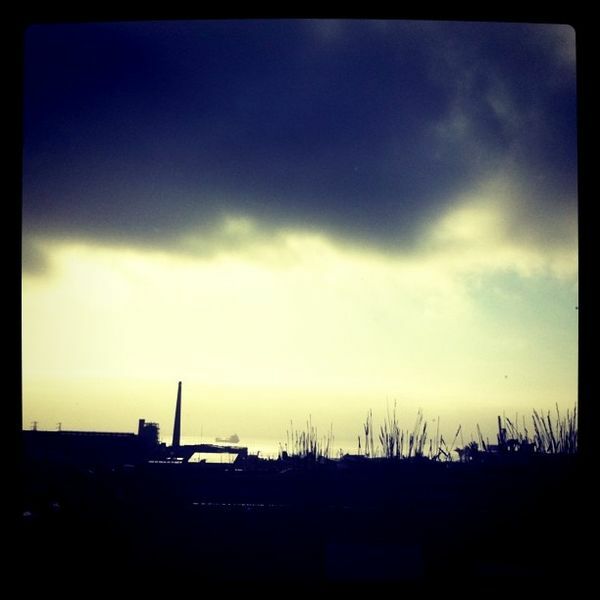 The questions, and the possible parsings, ripple outward and onward. Parsing images is something so familiar that we seldom bother to think about it. Parsing non-threatening images that are difficult to interpret can be a source of pleasure, probably for the same reasons that solving crosswords or Sudoku puzzles can be pleasurable. This principle can be used to make images and buildings more attractive. It can also be used to make buildings and places more easy for people to understand and to navigate. That will be the topic of another article. The images in this article are in the public domain, and/or are being used within fair use criteria (i.e. they are low resolution versions of images that are already widely circulated on the Internet, and that are being used within an academic article). If you found this article interesting, you might enjoy an excellent article by Ramachandran & Hirstein on the underlying neurology of aesthetic appreciation of art. This entry was posted in aesthetics, art, design, metalanguage, useful concepts and tagged ambiguity, Blind Spot, parsing art, Rothko by hydeandrugg. Bookmark the permalink.